Young Cartrefi Conwy tenants dream of playing for Wales | News by Wales Express News, People Before Profit! A housing association is aiming to fast track young tenants to rugby stardom – and dreams of playing for Wales. Andrew Bowden, chief executive of Cartrefi Conwy with RGC players to promote the fact Cartrefi is sponsoring the rugby club again. From left, Jacob Botica, Tiaan Loots, Evan Yardley and Afon Bagshaw with Cartrefi Conwy mascot. 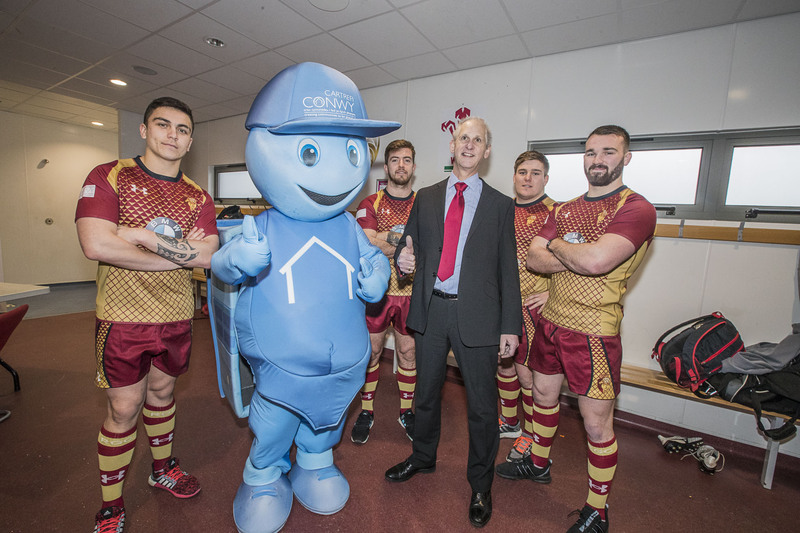 Cartrefi Conwy have signed a three-year partnership deal with Principality Premiership rugby side RGC which will see the housing association’s logo on the sleeves of the home and away kits and the club Regional Age Grade kits. As part of the agreement, the plan is for the sons and daughters of tenants to have the opportunity to join the RGC Academy and hopefully progress through the ranks. For their part, the regional rugby club will become involved in community initiatives with Cartrefi Conwy. After winning the Welsh Rugby Union Division One East in 2010 the club was promoted to the Welsh Championship and after several successful seasons the club was promoted to the Premiership after claiming a top four finish in May 2016. They’re based at Parc Eirias which also successfully hosts Wales Under 20s international matches. Cartrefi Conwy chief executive Andrew Bowden is keen for tenants to have the chance to attend RGC matches. Mr Bowden said: “We want to see our tenants involved and the hope is we will see a boy and a girl, who are Cartrefi Conwy tenants, joining and succeeding in the RGC academy within this next three year term. You never know, one day one of our tenants could play for Wales. “We want our tenants to come down to games and get involved in what is a huge success story. No one thought that RGC, a North Wales club, could compete with the big South Wales sides but they have and they continue to inspire. “RGC is a centre of excellence and we can learn so much from what they do. We, within the Cartrefi Conwy management team, want to share their focus. “We want to observe and learn from how the RGC management works to get the best out of their players and we can use that philosophy to get the best out of our team. As part of the partnership deal five pairs of family tickets for every home game will be made available free to Cartrefi Conwy tenants. And each season Cartrefi Conwy will be match day sponsors for one game and at that game one lucky young tenant will be the official mascot and will lead the teams out onto the pitch. He added: “Working with RGC we want to develop a brand that works for the players on the field and works for us off the field. We involve RGC players in what we do whether it’s our Big Day Out, our Big Bulb Plant or any other community scheme. “And I know RGC’s young players gain a great deal from the experience too. It helps them develop and shows them how they can work with communities away from the club. Sion Jones, General Manager of the North Wales Development Region and RGC, said: “It’s really important we have a close relationship with the community and we achieve that through our close ties with Cartrefi Conwy. “We want to involve and develop community initiatives that improve the prospects for tenants and residents right across the region. “We want to see at least one boy and a girl, Cartrefi Conwy tenants, joining our academy as young players, 15-year-olds, and progressing through the age groups. I see no reason why we can’t achieve that.